Alexi Bolton (front right), a rising senior at UA, created Inspired Arts, a free summer camp for children in Madison. Alexi Bolton isn’t yet sure of her postgraduate future – she’ll receive bachelor’s degrees in social work and marketing in May 2019 – nor does she know what will become of her “baby,” Inspired Arts, a free arts camp for children she created in 2015 in her hometown of Madison. When the third edition of Inspired Arts wraps this month in Madison, it will have served 135 students between both Madison and Tuscaloosa, where Bolton held her first camp in June. After three years of using musical theater, drama, dance and art to unearth creativity and positivity in children, she’s discovered firsthand the wisdom elders often impart to youth: do what you love. As the African proverb says, it takes a village to raise a child, and Bolton’s village is growing. 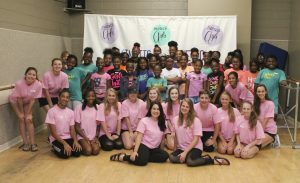 UA alumna Haylee Blackmon teaches dance at the Tuscaloosa camp earlier this month. High school and college students with backgrounds in various arts power the Inspired Arts staff each year. The Madison edition of the camp also has established connections with restaurants and dance studios. Bolton’s ambition to start a camp this year in Tuscaloosa meant working the phones for meal and venue sponsors, camp instructors and participants. Bolton found campers through one of her professors, Dr. Tania Alameda-Lawson, associate professor of social work at UA and director of Alabama TOPS, an out-of-school research program in Holt. UA students like Amelia Volpe and Jamie McKelvy joined and taught classes, and First United Methodist Church offered its grounds for classes and performances. During the second week of June, Bolton and her staff taught a variety of poems, songs and dances, from hip hop-inspired themes to a ballet rendition of “Swan Lake.” The week concluded with a performance for friends and family. McKelvy, a UA engineering master’s student from Huntsville, knew Bolton through the Wesley Foundation ministry at UA. 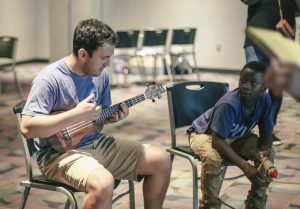 A former member of the Million Dollar Band, he plays the ukulele and had previously taught music at a youth camp in Hartselle. While Bolton’s pitch to him was an easy sell, McKelvy said he was unsure what to expect because he didn’t know the kids or their previous experiences in music. But in teaching harmony, melody and rhythm, the children surprisingly gravitated toward learning chords, which require a greater level of focus and listening, McKelvy said. “It’s hard for kids to stay focused for that,” McKelvy said. “But then they asked to do it the rest of the week. And once they knew I could play other instruments, they’d ask me to show them. They really enjoyed that. Bolton knew she needed to incorporate expert assistance and evidence-based research not only to lift Inspired Arts off the ground, but to create a truly dynamic program. Jamie McKelvy, a UA graduate student in engineering, plays the ukulele for campers. She leaned on Charlye Adams, economics and legal studies instructor at UA, to guide her through the paperwork to make Inspired Arts an official enterprise. Bolton further strengthened Inspired Arts with knowledge of innovation, market analysis and strategy learned in classes she’s taken at UA. Emeline Earman, an advertising major and member of the Minerva ad portfolio program at UA, is Inspired Arts’ creative director and manages social media, photography and marketing materials. Bolton blends her educational and camp experiences to help her streamline curriculum that “hits with our students.” She credits the School of Social Work for influencing Inspired Arts’ curriculum and activities with evidenced-based practices she’s learned in class. For instance, Inspired Arts has incorporated an element of wellness into daily activities. Though the future of Inspired Arts is uncertain, McKelvy believes the infrastructure is in place for it to continue.